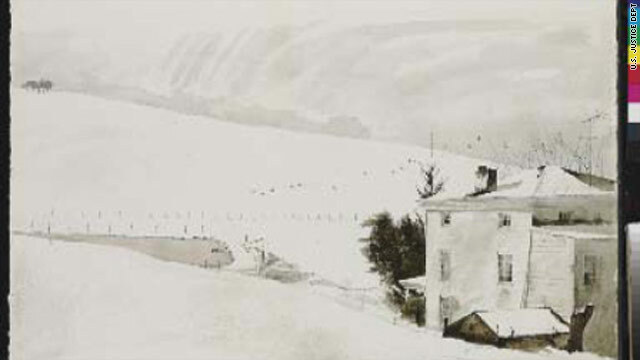 This is an image of the forged Andrew Wyeth watercolor "Snow Birds." Wyeth created the original in 1970. (CNN) -- An Andrew Wyeth watercolor that was about to be offered at a major New York auction house was found to be a forgery before the sale could take place, federal authorities announced this week. An art dealer in Seattle, Washington, who had been involved in a previous transaction with the genuine "Snow Birds" painting called Christie's auction house in New York to question its authenticity, said Mary Landa, curator of collections at the Brandywine River Museum in Chadds Ford, Pennsylvania. Landa, a Wyeth expert, confirmed that it was a fake. "Christie's did the right thing and followed up," said David Hall, the assistant U.S. attorney who is leading the investigation. "It was a really good fake, and that's why it was able to get as far as it did," Hall said. "It was close -- very close -- but not the real thing," said Landa, curator of collections with the Brandywine River Museum, the Wyeth artist family's home museum. "It was a really skilled forgery," she said, but she recognized it as a fake almost immediately. "Once we saw it in person, I could see little things that Mr. Wyeth never would have done," Landa said. Christie's had expected the painting -- had it been genuine -- to fetch $300,000 to $500,000, U.S. Attorney David Weiss said. The person selling the forgery agreed to forfeit it to the government, and no one has been arrested or charged, Hall said. The seizure was made in July; the Justice Department did not announce it until the forfeiture process was complete, Hall said. The fake "Snow Birds" was the second Andrew Wyeth forgery intercepted by Hall since the iconic American artist died in January 2009. "It's not uncommon to see a spike in forgeries and frauds after an artist's death," Hall said. "There have been a number of things that have arisen since Mr. Wyeth's death," Landa said, including some obvious fakes that people tried to enhance simply by adding Wyeth's name. The genuine "Snow Birds," which Wyeth created in 1970, remains in private hands, she said.